Slipping through the net again. Corruption at the police department and on a political level. A political game for a top job. The policeman and the criminal go hand in hand against corruption. The good cop lets the top criminal escape. That’s it in a nutshell. 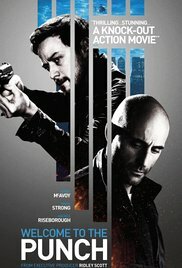 Again a police thriller with the standard routine and nothing earth-shattering. The opening scene was quite interesting in terms of visualization. But it felt as if it was going to be something futuristic with those big glassy buildings and deserted streets. Mark Strong was very impressive in his role as the fierce intellectual top criminal. He almost has a facial expression like Statham. I also liked the interaction and dialogues between Max and Sarah : refreshing and humorous. Daniel Mays also knows how to pick his parts because just like in “The Bank Job” (I’ve recently watched that one too) he kicks the bucket here too. But in general it was only a weak movie and a thin story. And one thing that annoys me the most is the amount of ammunition fired and the amount of misses.